I love travelling through the mountains. The way the light plays off the mist in beautiful and sometimes eerie ways amazes me. 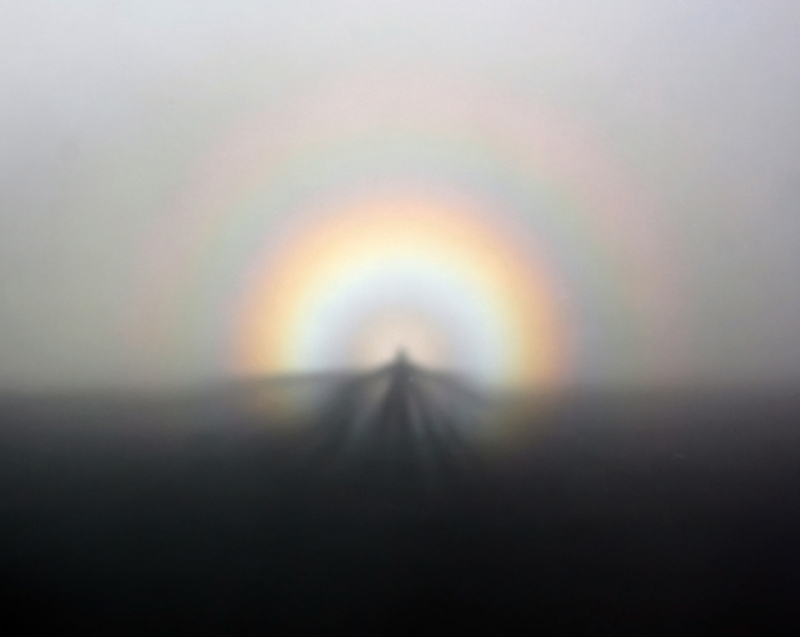 If you're lucky enough to be at the right place at the right time, you might experience a rare and seemingly supernatural optical phenomenon called Brocken specter, named after the highest peak in the Harz mountains in Germany. German Folklore dating back to the 17th century says that on the night of April 30 each year, exactly six months after Halloween, witches and sorcerers gather on the Brocken and revel with their gods as they await the arrival of spring. 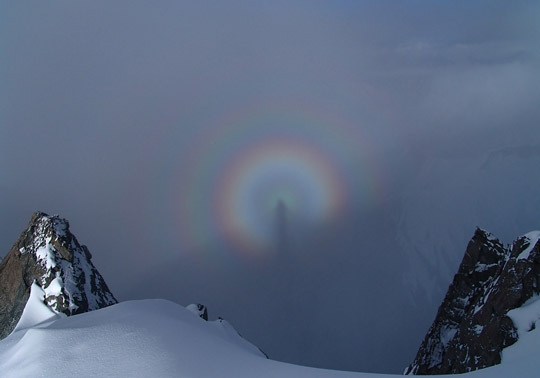 Among mountain climbers there is a superstition that a person who sees a Brocken specter will someday die on the mountain; local climbers have been so startled by the sudden appearance of a Brocken specter that they fall to their death, not realizing they are seeing their own harmless shadow. The Brocken specter appears when the setting sun casts a shadow from directly behind a climber at a higher altitude onto a cloud or mist at a lower altitude. When the shadow is cast upon a mist the sunlight surrounding it enters the suspended water droplets in the air and reflect back to the observer via diffraction, creating a rainbow-colored halo around the shadow's head. This halo is called solar glory. The Brocken specter may appear to be huge because the fog hampers your depth perception. Only one's own shadow, seen in a mist, can converge with the antisolar point and combine with the solar glory to create the Brocken specter. Therefore, if you are travelling in a group you can only see your own Brocken specter. Brocken specter from the Pamir Mountains of Tajikistan. wow. this is an amazing quiz with such wonderful pics. really appreciate your efforts.